Description: Mario Kart 64 was the first 3D Kart game created by Nintendo. It was first released back in 1997. It received rave reviews from video game critics. 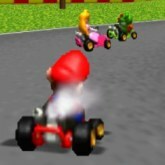 Mario Kart 64 featured 8 main characters from Nintendo games, including Mario, Luigi, Princess Peach, Toad, Yoshi, Bowser, Wario and Donkey Kong. The gameplay was very hefty because there were so many tracks to race on, featuring 16 race courses and 4 battle courses. Winning races and collecting power ups used to throw at racing opponents, was a lot of fun. With 4 modes to play, including Grand Prix, Time Trial, Versus mode and battle mode.Back in the day me and my bro loved playing this one split screen for hours upon end! Game Controls: Enter Key = Start Button. "W,A,S,D" Keys = Move. "K" Key = Accelerate. "J" Key = Brake. "L" Key = Use Power Collected. "i" Key = Change View. Select option icons located at the bottom of the game screen to edit controls, Play In Full Screen, Save/Load game progress, and change graphics settings.